Evan Chakrin, harvests leeks from a hydroponic raft bed Aug. 4, 2017 at the new UMass Hydrofarm he co-founded at the university with Dana Lucas, 21, a senior studying Sustainable Food and Farming. Overhead, LED strip lights supplement daylight for the plants. 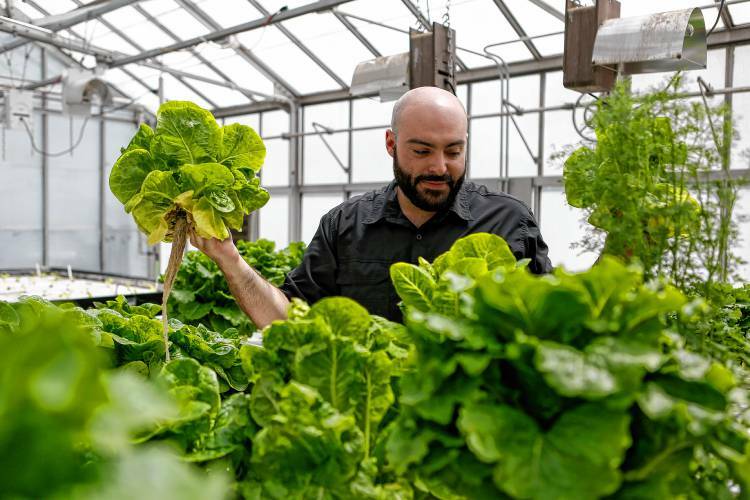 AMHERST — Evan Chakrin, 33, spends his summer afternoons harvesting plants, mostly lettuce, at a hydroponic food farm. He worked Friday afternoon, harvesting 10 pounds of lettuce that he was planning to donate to the Amherst Survival Center. He picked a head, doused it in insect soap and packaged it in a clam-shaped container. The hydroponic farm grows food without using soil. Started in the winter of last year, it is the first of its kind on the University of Massachusetts Amherst campus. The farm provides food for on-campus restaurants such as Earthfoods Cafe. Chakrin, a junior studying horticulture, co-leads the farm with Dana Lucas, 21, a senior studying Sustainable Food and Farming, using techniques that they say will revolutionize the future of farming. 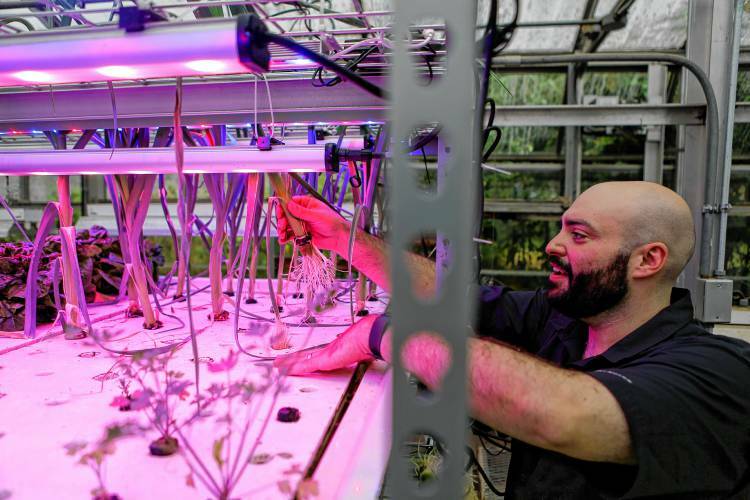 “It’s basically just using science to grow plants,” Chakrin said. The farm grows everything from strawberries and tomatoes to lettuce and kale. It is housed in an underutilized greenhouse on the UMass Amherst campus. Chakrin and Lucas use the most common hydroponic techniques to grow their plants: raft systems and nutrient film technique channels. The basic idea behind hydroponic farming is growing plants without soil, Chakrin said. Nutrients get dissolved into water surrounding the plants’ roots. This allows the system to be up to 90 percent more water- and nutrient-efficient than other types of farming. The system uses less water than an irrigated field. There is also no nutrient runoff into local water sources. “We can totally control whatever we waste,” Chakrin said. Lucas started working on the idea of creating a hydroponic farm in 2015, but she and Chakrin were not able to secure a grant until last December. The two received $5,000 and a previously underused greenhouse from the Stockbridge School of Agriculture. As soon as they got the space, they started working right away. They started germinating seeds, and by the middle of February, all of the systems were up and running. They then started selling their food to places on campus. The money from the sales goes into a fund that they can use to purchase more equipment or seeds. Chakrin said selling the products allows them to be financially stable and gives the business a fresh, locally produced food option. The farm will continue to grow in the years to come. 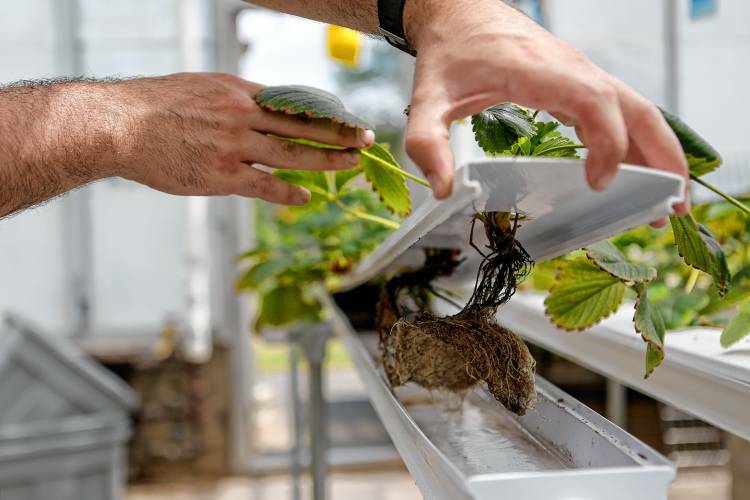 In the fall, the two are teaching 12 undergraduate students in a one-credit practicum course about hydroponic farming. The university offers many courses on the theories and science behind farming but not many on hydroponic techniques. Allowing other students to work in the farm gives them hands-on experience, Chakrin said. Chakrin said he hopes any students who are involved in urban food production get involved, even those not involved in the Stockbridge School of Agriculture. The two also want to scale up their sales. Chakrin said he is hoping to start selling to bigger dining halls and other places on campus. One of the benefits of hydroponic farms is that they can be used to grow food locally, even in urban areas. The lettuce grown at the UMass farm doesn’t come from some giant farm in California, Chakrin said. This reduces shipping costs and carbon costs for interstate shipping. “I think it is a major loss that the average bite of food travels extremely far to get to our plates, and this is the solution to the problem,” Lucas said. Lucas and Chakrin have started a consulting service for the future of farming, called Farmable. Lucas said the idea behind it is that any space, even small urban areas, can be made into a green space. “Anywhere is farmable and this concept will revolutionize how urbanites are able to access food,” Lucas said. Yesterday, I took a tour of the UMass Agricultural Learning Center with our summer class, Clean Energy and Sustainable Agriculture, taught by Sarah Berquist and Amanda Brown. The Ag Learning Center is something of a “student playground” where Stockbridge School of Agriculture students get practice farming and gardening. You are welcome to visit the facility and if you bump into any students be sure and ask them about their projects! Here is a Map to the farm and here are a few photos from the tour…. These projects were supported by the UMass Stockbridge School of Agriculture….